I have a confession, dear readers. I may well have to hand in my geek card and leave Internet Comic Critics Local 401 in shame once this review is over. But I am nothing if not honest and honesty demands that I come clean upon this matter. Until today, I've never read a single issue of Astro City. I know! I know! I have no good reason for this, save the same reasons everyone has (money is tight, time is limited, etc.) for never reading a classic. And make no mistake - Astro City is a classic. While I've never read the series, I'm broadly familiar with it, the themes behind it and a few of the major characters. When it first premiered in 1995, Astro City was a beacon in the midst of The Dark Age of Comics. It was one of the first Modern Age comic books, which mixed the sophisticated storytelling techniques that became more commonplace during The Dark Age with the trappings and optimism of The Silver Age. It was a love letter to everything about superheroes and comic books that inspires hope and makes us feel like kids again. Kurt Busiek speaks to new and old readers alike in his afterword on the title page of this issue. He apologizes to long-time fans for the delays in bringing this volume about and explains to the newbies how, despite this issue having a big #1 on the cover, there's 59 issues of Astro City before this. He then assures the new readers that every effort has been made to make this new series accessible to them. For the most part, this first issue is successful in that goal We do have a lot of characters thrown at us that a new reader won't recognize but it's not important toward the overall plot. And what is the plot you ask? 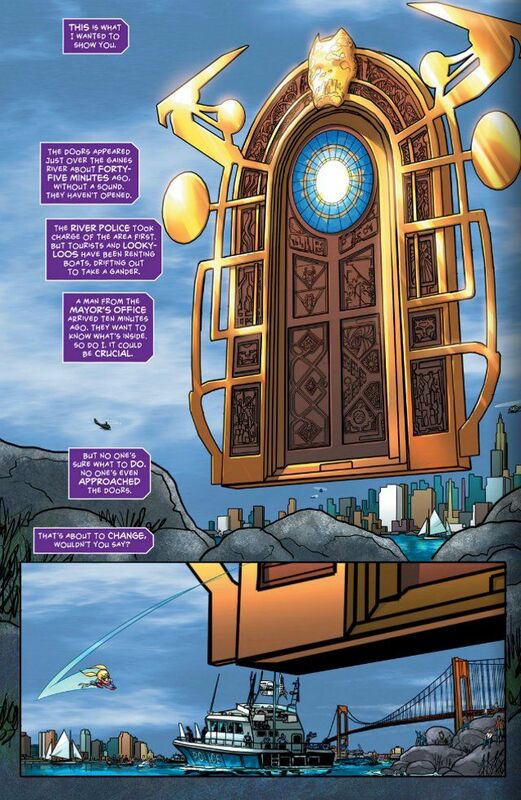 Classic comic book craziness, as a mysterious set of doors appears in the harbor over Astro City's port and proves resistant to all the local superheroes' efforts to open it. While I'm new to Astro City, I'm well familiar with Kurt Busiek's writing and the grand master is still in fine form. I know enough to know that this series is less about superheroes and more about people - the people behind masks and the people they save - and this issue is indicative of that theme, with more attention being paid to one ordinary man than to the more colorful characters behind him. The overall effect is one that will leave new readers wanting to track down the older Astro City stories so they'll know who the heroes in the background are rather than feeling annoyed that we get no explanation or introduction to them here. 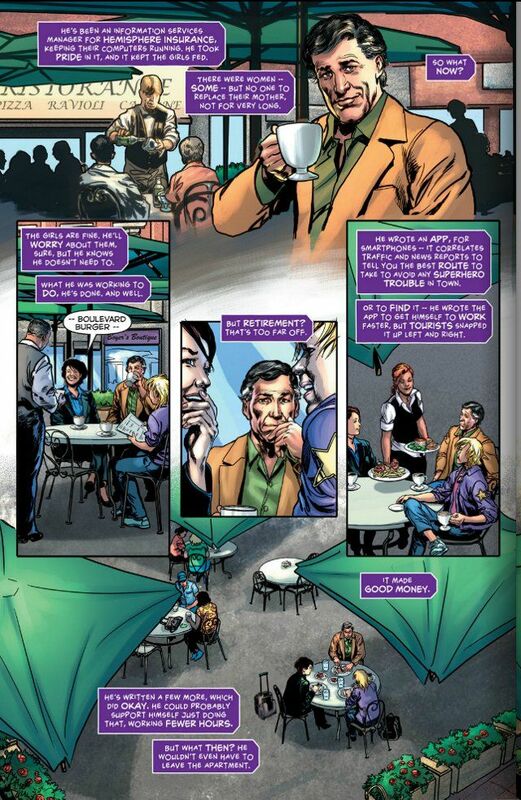 Artist Brent Anderson matches Kurt Busiek for quality and creativity. Best known for his work on the classic X-Men story God Loves, Man Kills, Anderson is a great artist in his own right and - it turns out - no mean mimic of other artistic styles. My favorite moment of the issue involves a bit that I shan't reveal here but it simultaneously manages to be both a hilarious parody of/glorious tribute to the works of Jack Kirby. Bottom Line: This is a great read and a wonderful introduction to Astro City. I'm kicking myself for not having visited it sooner and encourage you all to avoid my mistake. On that note, Comixology currently has the very first Astro City story free for download and a lot of the other issues for sale at $1.99 each. I know I'll be downloading as much of the series as I can come pay-day and I'm sure I won't be alone!